Translator tool provided for the benefit of our viewers. Mack Hauling makes removing unwanted junk easy. 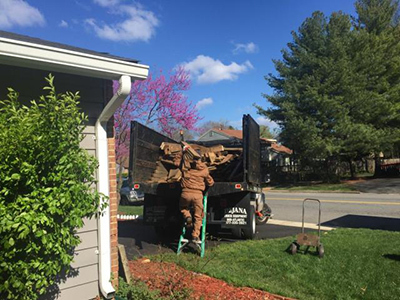 When you need junk removal in Springfield Virginia you can count on Mack Hauling to get the best prices and fast, reliable service. Let us help you with your Springfield VA junk removal for construction, commercial or household goods today. Call our junk removal experts today and live clutter free! We have worked very hard to grow our business to provide you with the best experience possible when it comes to getting rid of your unwanted stuff. 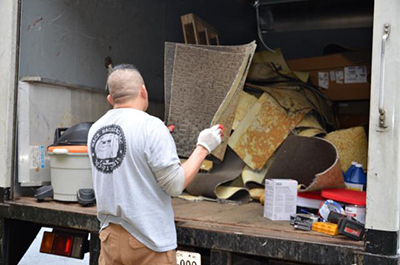 The pros at Mack Hauling Junk Removal bring simplicity and integrity to the junk removal industry, with easy ONLINE BOOKING and upfront pricing. We want to make getting rid of your junk as easy and stress free as possible. Mack Hauling offers full-service junk removal for your home or business including offices, retail locations, construction sites, and more. We leave your area spacious, clutter free and in swept condition. There is no need to break your back or go through the trouble of renting a truck, loading your junk, hauling it to a proper disposal yard and paying those fees. Our friendly team members are happy to meet all your junk hauling needs. We serve the entire Springfield area in Fairfax County including Franconia, West Springfield, Newington, Annandale, Burke, Fort Belvoir, Lorton, Landmark, Lincolnia, Falls Church, Seven Corners, Rosslyn, and all surrounding areas. Mack Hauling removes junk and other unwanted items from apartments, homes, construction sites and businesses. It doesn’t matter if it’s a single item, construction debris, or an office or garage full of junk. Mack Hauling will remove the junk and transform your cluttered space into a useable one. Any and all recyclable junk will be disposed of in an environmentally friendly way. We Take Just About Anything in Springfield VA! We Haul Junk And Remove It From Springfield Va! We can take almost anything you can find in today’s home. Appliances, furniture, 2×4’s, pallets, left over construction debris, sinks, clothes, mattresses, tubs, entertainment centers, tables, chairs, beds, televisions, sheds, fences, decks and many more items. We also help with your seasonal cleaning by removing items you have left over from garage sales that didn’t sell and all the clutter that has accumulated over the years. We will go in your basement or attic and leave the area completely cleaned up and clutter free. If you know someone with a hoarding issue, you know it will take a professional to do the clean-up job. Mack Hauling is that professional locally owned company to get the job done right with sensitivity to the residents. Is your office moving? Do you need to get rid of the junk that you’re not taking? Mack Hauling takes everything from electronic waste such as computers, monitors and printers, to office furniture and even old documents and filing cabinets, full or empty. We have a team of trained professionals standing by to make it happen. Mack Hauling clears out all unused and broken furniture hauling it away to give you space for new items or just to have the space. We will take anything including couches, sofas, chairs, recliners, tables, desks, beds, dressers and more. We haul and properly dispose of old appliances. Do you have old appliances that are no longer working or in bad shape? Our professionally trained crew will arrive in needed junk hauling trucks to remove those old and heavy appliances so you don’t have to. Refrigerators, stoves, ranges, water heaters, dishwashers, washers, dryers, garbage disposals, and more. These are items that are important to recycle to help keep our environment green. Mack Hauling removes industrial equipment and machinery. We divert most industrial equipment from landfills by recycling most items we remove. We remove refrigeration equipment, heating equipment and furnaces, industrial light fixtures, ballast, cranes, dollies, pulleys and many more items. We help real estate agents manage and simplify their clients’ moves by clearing out the clutter – helping you sell homes faster! We offer dedicated customer service support, completing real estate and foreclosure cleanouts across the NOVA, Southern MD, and DC area. With our all-inclusive service, up-front prices and convenient scheduling, you don’t have to worry about a thing. Just leave your junk where it is; Mack Hauling will remove it for you! No matt the size of the job we have the trucks, crew, and experience to handle everything you prefer not to. We are a full-service solution. Our team will take care of all the post-job clean up, as well as recycling, sorting, and disposal of all leftover store debris. We remove it all – fixtures, displays, appliances, flooring and more. Mack Hauling can take anything in your office including filing cabinets, computers, monitors, fax machines, copiers, printers, and furniture. Anything you need gone, we can take. We will provide tenant cleanout services to apartment complexes in or near the Reston VA area including apartment complexes such as The Residences at Springfield Station, Saratoga Square, West Springfield Terrace, Springfield Square, Chelsea Square, Springfield Gardens, and any others. 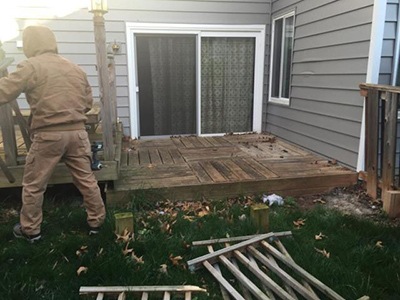 Get rid of the rotting deck, patio, or fence. 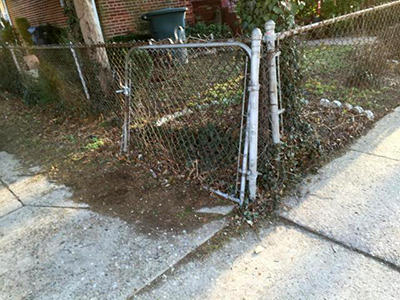 Old lawn equipment cluttering your yard – we will get rid of it. Rusting broken shed not good enough to store things in anymore? We will demolish it and remove it. Get rid of old play equipment, pools, and hot tubs. What about landscape debris? We will clear it all out! Get rid of your junk now! Call us today or complete our FREE ESTIMATE request form to schedule an appointment. We take pride in improving our environment. That is why Mack Hauling of Northern Virginia Recycles.